HyperGold Web Services opened its doors in 1995, providing website design, marketing and development services for businesses and nonprofit organizations. Although HyperGold is compact, many of our projects are quite extensive, involving custom programming and software development. Elaine Murphy and Rob Wood, along with other designers and programmers, supply the marketing, business and technical expertise to create and maintain successful websites for our clients. Over the years, the HyperGold client group has spanned a considerable range -- technology, staffing, hospitality, art, e-commerce retail from wine to collectibles to florists, professional services, and school districts to name a few. HyperGold is also well-seasoned in content management, and can produce inexpensive, customized solutions for our clients who want to update their own web content, or who want to manage their own online stores. 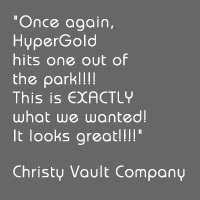 Some of the largest companies in California have used HyperGold for Web development projects as well as marketing consultation and search engine optimization. They come to us for our business and technology expertise, and stay with us for our superior customer service. Our professional memberships include the HTML Writers Guild, and the International Webmasters Association. We provide branded solutions that produce results. 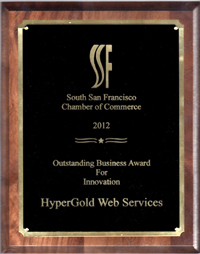 HyperGold is very proud to have been given the prestigious Outstanding Business Award for Innovation (above) by Jackie Speier on behalf of the South San Francisco Chamber of Commerce at its annual awards dinner. From marketing to maintenance -- from consulting to original design -- our clients are the most important people in the world.